"AGNI" redirects here. For the magazine, see AGNI (magazine). For other uses, see Agni (disambiguation). The two-stage Agni technology demonstrator, with a solid-fuel first stage, was first tested at the Interim Test Range in Chandipur in 1989. It was capable of carrying a conventional payload of 1,000 kg (2,200 lb) or a nuclear warhead. This original technology demonstrator evolved into the solid-fuel Agni-1 and Agni-2 missiles. India first developed the two-stage 2000 km range Agni-2, testing it in 1999. It then used the first stage of this system to develop the 700 km range single-stage Agni-1, which was first tested in January 2002. Weighing 12 tonne with a length of 15 metres, Agni-1 has a range of 700–900 km and is capable of carrying a conventional payload of 1,000 kg (2,200 lb) or a nuclear warhead at a speed of 2.5 km/s. Agni missiles consist of one (short range) or two stages (intermediate range). These are rail and road mobile and powered by solid propellants. Agni-I is used by the Strategic Force Command (SFC) of the Indian Army. The latest missile test occurred on 13 July 2012, when India test fired Agni I successfully at Wheeler Island off Orissa coast. On April 11, 2014 the missile was test fired for the first time in a night trial exercise to its full range of 700 km from the Wheeler island off the Odisha coast. The missile randomly picked from production line was test fired by the Strategic Forces Command after 11 pm in the night. This test was first night after 2 previous test failed due to technical glitches. The missile was test fired from a mobile launcher with logistics support from DRDO at the Integrated Test Range as part of the regular training exercise by the armed forces. Agni-II with a range of 2,000–2,500 km is 20 metres long, has a diameter of one metre, and weighs around 18 tonnes. Agni – II uses solid propellant in both of its two stages. They are claimed to be a part of the "credible deterrence" against China and Pakistan. 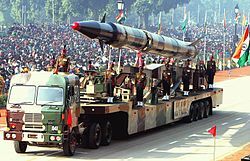 India stated that its nuclear and missile development programmes are not Pakistan-centric, that the Pakistani threat is only a marginal factor in New Delhi's security calculus, and that Agni is at the heart of deterrence in the larger context of Sino-Indian equation. The 2000 km range nuclear weapon capable missile, already inducted into country's arsenal, was successfully launched as a training exercise by the Strategic Forces Command on 9 August 2012. India on 7 April 2013 conducted its latest test of its nuclear capable Agni-II strategic ballistic missile from a missile testing range in Odisha. The test was conducted from Wheeler's Island in Bhadrak district, by army personnel as part of a training exercise. Agni-III is the third in the Agni series of missiles. Agni III uses solid propellant in both stages. Agni-III was first tested on 9 July 2006 from Wheeler Island off the coast of the eastern state of Odisha. After the launch, it was reported that the second stage of the rocket did not separate and the missile had fallen well short of its target. Agni-III was again tested on 12 April 2007, this time successfully, again from Wheeler Island. On 7 May 2008 India again successfully test fired this missile. This was the third consecutive test; it validated the missile's operational readiness while extending the reach of India's nuclear deterrent to most high-value targets of the nation's most likely adversaries. Agni-III has a range of 3,500 km, and can take a warhead of 1.5 tonnes. It has been reported that the missile's circular error probable (CEP) lies in the range of 40 meters, This would make Agni-III the most accurate strategic ballistic missile of its range class in the world. This is of special significance because a highly accurate ballistic missile increases the "kill efficiency" of the weapon; it allows Indian weapons designers to use smaller yield nuclear warheads (200 kiloton thermonuclear or boosted fission) while increasing the lethality of the strike. This permits India to deploy a much larger nuclear force using less fissile/fusion material (plutonium/lithium deuteride) than other nuclear powers. Older ballistic missiles, such as those deployed by earlier nuclear powers required larger yield (1–2 megaton) warheads to achieve the same level of lethality. It has also been reported that with smaller payloads, the Agni-III can hit strategic targets well beyond 3,500 km. Agni-IV is the fourth in the Agni series of missiles which was earlier known as Agni II prime. Agni-IV was first tested on 15 November 2011 and 19 September 2012 from Wheeler Island off the coast of the eastern state of Orissa for its full range of 4,000 km. The missile lifted off from a road mobile launcher at 11.48 a.m. and after climbing to an altitude of over 800 km, it re-entered the atmosphere and impacted near the pre-designated target in the Indian Ocean with remarkable degree of accuracy following a 20-minute flight. Carrying a payload of explosives weighing a tonne, the missile re-entered the atmosphere and withstood searing temperatures of more than 3,000 °C. With a range of 3,000–4,000 km, Agni-IV bridges the gap between Agni II and Agni III. It was again successfully test fired on 20 January 2014. Agni IV can take a warhead of 1 tonne. It is designed to increase the kill efficiency along with a higher range performance. Agni IV is equipped with state-of-the-art technologies, that includes indigenously developed ring laser gyro and composite rocket motor. It is a two-stage missile powered by solid propellant. Its length is 20 meters and launch weight 17 tonnes. It can be fired from a road mobile launcher. Agni-V is a solid fueled intercontinental ballistic missile (ICBM) developed by Defence Research and Development Organisation (DRDO) of India. It will greatly expand India's reach to strike targets more than 5,500 km away. Agni-V was first test fired on 19 April 2012 at 08:07 am IST from Wheeler Island off the coast of Orissa, the test was successful. Agni-V ICBM has been designed with the addition of a third composite stage to the two-stage Agni-III missile. To reduce the weight it is built with high composite content. The 17.5-metre-long Agni-V would be a canister launch missile system so as to ensure that it has the requisite operational flexibility and can be swiftly transported and fired from anywhere. Agni-V weighs around 49 tonnes; one tonne more than Agni III and a much longer range. The second test launch of Agni-V was successfully done on 15 September 2013 at 08:43 am IST from Wheeler Island. In January 2015, the canisterized version was successfully tested from Wheeler Island. Agni-VI is an intercontinental ballistic missile reported to be in early stages of development by India. It is to be the latest and most advanced version among the Agni missile program. It will be capable of being launched from submarines as well as from land, and will have a strike-range of 8,000–10,000 km with MIRVed warheads. In May 2008 Indian scientists announced they had developed and patented a path-breaking technology that increases the range of missiles and satellite launch vehicles by at least 40%. The enhanced range is made possible by adding a special-purpose coating of chromium-based material to a rocket's blunt nose cone. The material acts as a reactive-ablative coating that forms a thin low density gaseous layer at the tip of the rocket as it approaches hypersonic speeds; this super-heated gas layer reduces drag by 47% (at mach 7–8), thereby allowing range enhancements at least 40%. It has been announced that this technology will be incorporated in future Agni deployments after having undergone ranging and calibration tests. ^ "Technical tune to Agni test before talks". Calcutta, India: The Telegraph. 30 August 2004. Archived from the original on 11 December 2007. Retrieved 13 December 2007. ^ a b c d e f "India successfully test-fires Agni I ballistic missile". Indian Express. 25 November 2010. Retrieved 19 October 2011. ^ a b Subramanian, T.S. (15 November 2011). "Agni-IV test-flight a 'stupendous success'". The Hindu. Chennai, India. ^ a b c d e f "DRDO plans to test 10 missiles this year". The Times of India. 27 January 2011. Retrieved 19 October 2011. ^ a b c d e f g "Agni-VI with 10000 km range to be ready by 2014". IBNLive. Retrieved 17 July 2012. ^ a b c d Mallikarjun, Y. (18 May 2010). "Agni-II missile test-fired successfully". The Hindu. Chennai, India. Retrieved 20 October 2011. ^ a b "Nuclear-capable Agni-III missile test-fired". Deccan Herald. 7 February 2010. Retrieved 19 October 2011. ^ a b c "India test-fires nuclear-capable Agni-I missile". The Times of India. 25 November 2010. Retrieved 19 October 2011. ^ a b "Agni-3". Missile Threat. 19 July 2010. Retrieved 23 February 2012. ^ "Eyeing China, India to enter ICBM club in 3 months". Times of India. 17 November 2011. Retrieved 23 February 2012. ^ "India successfully test-fired Agni-I". Asian Tribune. Archived from the original on 31 May 2012. Retrieved 20 October 2011. ^ "India Tests Agni-II Missile". Aviation Week. 30 September 2011. Retrieved 20 October 2011. ^ Subramanian, T. S.; Mallikarjun, Y. (7 February 2010). "News / National: Agni-III launch a complete success". Chennai, India: The Hindu. Retrieved 20 October 2011. ^ "India test-fires nuclear-capable Agni-I missile". The Times of India. 25 November 2010. Retrieved 19 October 2011. ^ Vishwakarma, Arun (1 July 2007). "Indian Long Range Strategic Missiles" (PDF). Lancer Publishers and Distributors. Archived from the original (PDF) on 29 November 2007. Retrieved 13 December 2007. ^ "Agni: India's fire power". Brahmand.com. Archived from the original on 20 October 2011. Retrieved 20 October 2011. ^ "Agni-2". CSIS Missile Threat. Retrieved 3 December 2012. ^ "India successfully tests nuclear capable Agni IV missile". The Hindu. 3 December 2014. Retrieved 1 February 2015. ^ "India developing 5,000 km-range Agni missile". Chennai, India: The Hindu. 25 March 2011. Retrieved 26 March 2011. ^ "Missiles of the World: Agni 4/5". Missile Threat. 19 July 2010. Retrieved 23 February 2012. ^ T. S. Subramanian (23 July 2011). "Preparations apace for Agni V launch". Chennai, India: The Hindu. Retrieved 24 July 2011. ^ a b "India to Join ICBM League soon". Daily Pioneer. 8 October 2011. ^ a b "Original Copy of the DRDO Newsletter on May 2011". ^ "India tests nuclear-capable Agni-I missile". The Times Of India. 13 July 2012. ^ Mallikarjun, Y. (11 April 2014). "Agni-1 clears night trial". The Hindu. Chennai, India. ^ "Successful test of Agni". theindianrepublic.com. Archived from the original on 19 April 2014. Retrieved 30 November 2015. ^ "Agni missile". bharat-rakhsak.com. Archived from the original on 14 October 2011. Retrieved 30 November 2015. ^ a b "New kid on the nuclear block". The Hindu. Chennai, India. 18 November 2011. Retrieved 4 December 2011. ^ "Feature". Pib.nic.in. Retrieved 20 October 2011. ^ "India successfully test-fires nuclear capable Agni-II missile". The Times Of India. 9 August 2012. ^ Subramanian, T. S. (8 August 2012). "Preparations on for Agni-II launch tomorrow". The Hindu. Chennai, India. ^ "India test-fires nuclear capable Agni-II missile". The Times Of India. 7 April 2013. ^ a b "AGNI-III launched successfully". Press Information Bureau, Government of India. 12 April 2007. Archived from the original on 2 December 2007. Retrieved 13 December 2007. ^ "Agni-2". CSIS Missile Threat. Archived from the original on 4 November 2016. Retrieved 31 August 2010. ^ a b c Subramanian, T.S. (15 November 2011). "Agni – IV successfully test fired". The Hindu. Chennai, India. Retrieved 15 November 2011. ^ "India tests long-range nuclear-capable 'Agni-IV' missile". The Times of India. 15 November 2011. Retrieved 15 November 2011. ^ PTI (19 September 2012). "Sci-Tech / Science : Long range strategic missile Agni-IV test-fired". Chennai, India: The Hindu. Retrieved 3 December 2012. ^ "Agni test fired". IBN. Retrieved 20 November 2015. ^ "India test-fires nuclear-capable Agni-IV missile". Hindustan Times. 15 November 2011. Archived from the original on 16 November 2011. Retrieved 15 November 2011. ^ "India tests nuclear-capable surface-to-surface Agni-IV missile". The Times of India. 15 November 2011. ^ "Agni-V, India's first ICBM, successfully test-fired". NDTV.com. 19 April 2012. Archived from the original on 23 June 2012. Retrieved 20 September 2012. ^ "Agni-V test-fired successfully". Ibnlive.in.com. Retrieved 20 September 2012. ^ "Agni-V now ready for induction into the Army". New Indian Express. Retrieved 15 September 2013. ^ "Agni 5, India's Longest Range Ballistic Missile, Successfully Test-Fired". The Arunachal Times. 31 January 2015. Archived from the original on 31 January 2015. ^ "Indigenous technology to increase range of Indian missiles by a third". domain-b.com. 14 May 2008. Archived from the original on 6 September 2010. Retrieved 31 August 2010. ^ "Indian-developed technology to boost range of missiles and protect re-entry vehicles". domain-b.com. 10 September 2008. Retrieved 31 August 2010. ^ "New tech to boost missile range by 40%". Economictimes.indiatimes.com. 10 September 2008. Retrieved 31 August 2010. ^ "Agni-1 | Missile Threat". CSIS Missile Threat. Retrieved 24 December 2012. ^ Alternate Name:Agni-II. "Agni-2 | Missile ThreatAgni-II". Missile Threat. Archived from the original on 18 October 2012. Retrieved 24 December 2012. ^ "Agni successfully test fired". The Hindu. Retrieved 2 October 2015. ^ "Agni-3 | Missile Threat". CSIS Missile Threat.com. Retrieved 24 December 2012. ^ "Agni-V vital: Tessy Thomas". The Hindu. 2 October 2013. Retrieved 23 October 2013. ^ "Agni-VI with 10000 km range to be ready by 2014". IBNLive. Retrieved 16 September 2013. Wikimedia Commons has media related to Agni missiles.